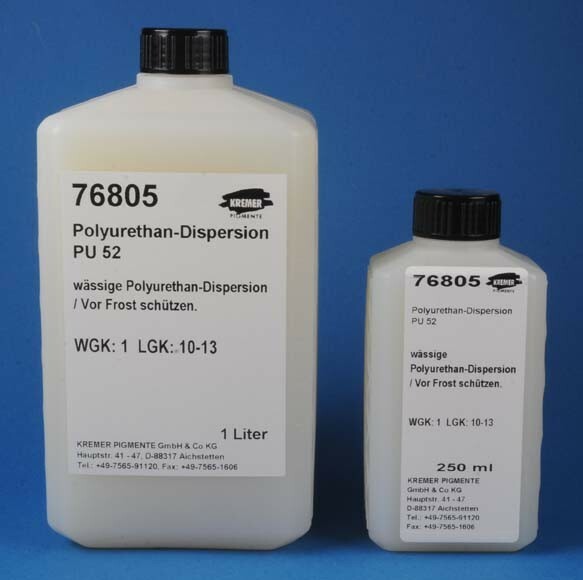 Polyurethane Dispersion PU 52 | Polyurethane, Latex Milk & other Dispersions | Dispersions & Binders | Mediums, Binders & Glues | Kremer Pigments Inc. Replacement of the Polyurethane Dispersion PU 52, no. 76800. The Polycarbonate-Polyurethane Dispersion No. 61 PC is harder and more transparent than the Dispersion PU 52 and still very elastic. The solid particle content is 37-39%. It is slightly alkaline. The minimal film formation temperature is +1°C. Chemical description Aqueous polyurethane dispersion. Customer evaluation for "Polyurethane Dispersion PU 52"